Within 250 miles of Las Cruces, NM. Two of the most challenging strokes to master are butterfly and backstroke because they require exact timing and a lot of coordination. At this high performance swim clinic, your swimmer will learn the essential components to swimming these strokes FAST from Olympic gold medalist Nick Thoman! He will also go over underwater dolphin kicking and breakouts! Register now before prices rise! Nick will will be in the water for two sessions designed for swimmers of all ages and ability levels. This high performance swim clinic covers four very challenging areas of elite level racing. Swimmers will learn to get more propulsion from every pull and kick so that they can drop time! BUTTERFLY: Butterfly does not have to be the hardest stroke! Learn the proper technique for a fast and efficient butterfly by learning from Nick Thoman! He will emphasize the best way to maximize propulsion in every arm pull while also covering body position, kick, breath, and timing! When you swim butterfly correctly, it should feel relaxed and smooth! BACKSTROKE: Engaging your core not only allows you to swim stronger, but it also allows you to hold the proper body line and get more propulsion out of every arm pull. Nick Thoman will help swimmers learn the importance of rotation and how to use it to your advantage for more power in each stroke. Your arm pull in backstroke should press the water to your feet using your whole paddle. Backstrokers are often the fastest kickers on their teams, find out why! UNDERWATER DOLPHIN KICKING: Did you know that the fastest you go IN the water is the streamline after pushing off the wall or diving in? The underwater dolphin kick enables swimmers to maintain that speed up to 15 meters on every length. The fastest swimmers in the world are always working to improve their underwater dolphin kicking with tighter, more effective movements. Nick Thoman is one of the greatest underwater dolphin kickers ever. He will teach you swimmers skills that will have an impact on every participant's races. BREAKOUTS: Swimmers MUST learn how to carry momentum from the underwater dolphin kicks into the breakout by timing the first stroke and staying streamlined. 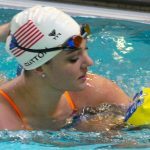 Your swimmer will practice keeping their head down and it'll make a big difference in their breakout! Take a photo while wearing the Nick's medals, get autographs, and a gift from TYR Sport!